1. December jobs report: The market-moving U.S. jobs report is set to come out at 8.30 a.m. ET from the Bureau of Labor Statistics. Between January and November, the country added 1.9 million jobs. Economists forecast there will be another gain of 190,000 new jobs in December. Job growth slowed down last year compared to 2016, but that makes sense after more than seven years of interrupted gains. As unemployment ticks down, job growth gradually slows. It's expected the 4.1% unemployment rate will be unchanged in December. 2. Stock market overview: U.S. stock markets have hit record highs every trading day this week and it looks like the trend will continue Friday. 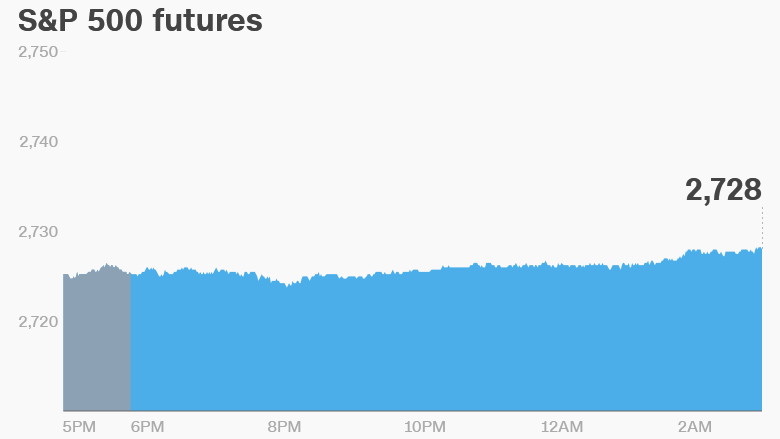 U.S. stock futures are pointing up, indicating the Dow Jones industrial average, S&P 500 and Nasdaq will pop at the open. European markets are nearly all rising in early trading. Major Asian markets closed the week with gains. 3. Apple fixing flaws: Apple (AAPL) has confirmed all its Mac systems and iOS devices are affected by two recently disclosed processor flaws called Spectre and Meltdown. In an announcement on Thursday, Apple said it had released mitigations to defend against Meltdown in iOS 11.2, macOS 10.13.2, and tvOS 11.2. It will release mitigations in Safari to defend against the Spectre bug "in the coming days," the release said. "There are no known exploits impacting customers at this time," Apple said, echoing what other companies and security researchers have said. 4. Toshiba's nuclear option: Toshiba's (TOSYY) disastrous foray into the U.S. nuclear business is coming to an end. The company is selling Westinghouse, its beleaguered U.S. nuclear unit, for $4.6 billion to Canadian investment firm, Brookfield Business Partners. The collapse of Westinghouse cost Toshiba some $6.4 billion, forcing the storied Japanese conglomerate to admit its financial future was in peril. It has been offloading assets in order to survive.